Seica will attend the historical appointment with the Chinese market of Nepcon China 2018 exhibition with products that enhance the level of technology applied to testing and assembly of electronic boards and components. The Italian company will showcase in Booth 1L30 the consolidated Pilot V8 and the Mini 200, providing all the details about the new generation of next> series systems, featuring a renovated and sleek look, thanks to the premium materials of the chassis and innovative electrical worth feature. The Industrial Monitoring solution “4.0 ready” by Seica, to monitor current absorption, supply voltage, temperature, light indicators and other parameters useful to indicate the correct operation, to ensure predictive maintenance, makes all systems compatible with the new standards of the fourth industrial revolution ongoing nowadays. the Pilot V8 with innovative electrical testing performance is undoubtedly the most complete flying probing test platform on the market. In its most complete configuration, the Pilot V8 tester will provide up to 20 mobile test resources for an electronic board, ranging from probes which can supply today up to 3 Amperes, high-resolution cameras for automatic optical inspection, barcode reading, laser, capacitive probes, pyrometers, optical fiber sensors for LEDs, flying connectors for boundary scan and On Board Programming, up to high-frequency probes for measurements over 1.5 GHz (an absolutely unique performance on the market). Highly oriented to medium and high volume production, the Pilot V8 will be available in a fully-automated version, making its vertical architecture perfectly suitable to be combined with board loading/unloading modules, capable of hosting from 1 to 12 board magazines (even of different types). All of the automation modules are standard and available in the Seica Automation catalog. The HR (high resolution) version of the Pilot V8 allows the system to test very small sized objects, around 30 μm, while the XL version extends the work area from the standard 610 x 540 mm to 800 x 650 mm, providing unique solutions for testing “extra-large” boards. 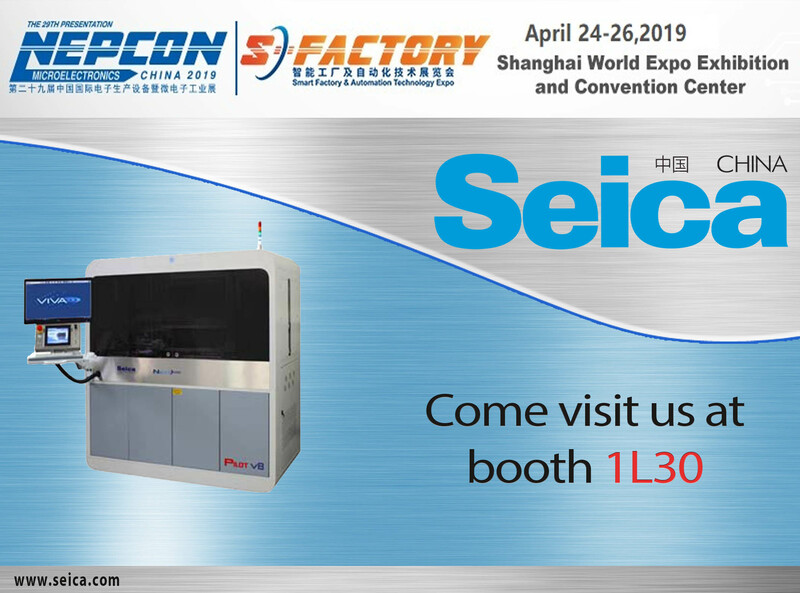 Seica will exhibit its small, compact and economical In-circuit test system called the Mini 200 benchtop unit, with up to 768 hybrid channels. It will allow customers a low entry point into production test. In addition to the Mini 200, the Compact TK will be on display which utilizes a built-in receiver for easy swap out of fixtures. The Compact line has channel counts from 192-4608 in a variety of manual, in-line, and combinational ICT and functional test options. The New Generation of FIREFLY Next> series LASER selective soldering systems is coming to the production markets. This new Firefly family, featuring a new attractive, stylish and renewed appearance compared to the Firefly version available on the market for over ten years, but capable of providing an outstanding technological leap. This system is capable of soldering both the top and bottom of the printed circuit board. Under the new shiny and bright “dress” made of steel and other premium materials, the Firefly combines its 4 essential innovations: new high-efficiency LASER source, new spot angle on the board to be soldered, fully-programmable donut spot size, and perfect axial integration of the LASER. Utilizing vision and continuous temperature feedback of the solder joint during the solder process provides an outstanding throughput in terms of applicability and reliability compared to the past generation and current competitors.